Published on February 20, 2012 in Awards, Calypso/Soca and Carnival. 0 Comments Tags: Calypso Monarch, Calypso/Soca, Competition, King of Carnival, Queen of Carnival. 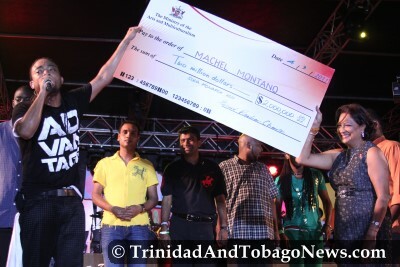 Duane O’Connor has dethroned Karene Asche at the Calypso Monarch competition to secure the $1 million first prize. O’Connor ‘s two songs, “The Hunt is On” and “Long Live Calypso,” received the judges’ collective nod to take home the crown at the Dimanche Gras show. He is also the Young King for 2012. Published on March 10, 2011 in Awards, Carnival and News. 0 Comments Tags: Band of the year, Carnival, Competition. Published on March 9, 2011 in Carnival and News. 0 Comments Tags: Carnival, Competition. THEY CAME, they trampled, they stomped as the Queen’s Park Savannah stage beckoned Carnival revellers, from far and wide, local and foreign, to “come to meh.” The Carnival revelry climaxed yesterday as thousands of masqueraders crossed the big stage. Blazing the trail with his hit Advantageous, International Soca Monarch Machel Montano is confident that the song will lead him to his fourth Road March title. Published on March 8, 2011 in Awards, Calypso/Soca, Carnival and Steelpan. 0 Comments Tags: Calypsoes, Carnival, Competition, King of Carnival, Queen of Carnival. REVELLERS dropped to their knees and kissed the big stage with reverence as Carnival returned to Queen’s Park Savannah, Port-of-Spain with a bang yesterday after an absence of several years. FORMER Junior Calypso Monarch Karene Asche yesterday morning became the first woman to win the National Calypso Monarch crown in almost a decade, and in the process made history by taking home the competition’s largest ever cash prize of $2 million. Published on March 7, 2011 in Carnival. 0 Comments Tags: Carnival, Competition, King and Queen, King of Carnival, Queen of Carnival. Published on March 2, 2011 in Calypso/Soca, Carnival and Videos. 0 Comments Tags: Calypsoes, Carnival, Competition, Cro Cro. Published on February 18, 2011 in Carnival and Videos. 0 Comments Tags: Carnival, Competition, Narcenio 'Senor' Gomez.